There are many times when we need easy fish recipes to make a quick dinner, not too complicated or time consuming, not too many ingredients, but still produce a fresh, healthy meal that tastes great. If that’s what you’re looking for this recipe is ideal. Although many Greek recipes can be quite time intensive, when it comes to their fish or psari meals, simplicity is the key to easy preparation. The Greeks love to be able to taste their fish, so just a few complimentary ingredients are added – they don’t cover it with strong sauces and marinades. For the best tasting, easy fish recipes, look for good quality psari. 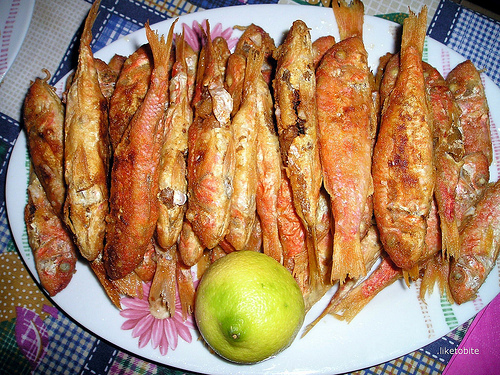 For this recipe Red Mullet – Barbounia is popular in Greece, but you can use any white, fresh fish – whole, fillets or steaks. The psari is simply placed in foil – it used to be paper, hence the Greek name – Sto Harti – “in paper”. Lemon juice, olive oil and herbs are added, all wrapped up in the foil and popped in the oven for half an hour! Easy! You really can’t get a more simple recipe, and still have a tender, succulent, moist fish to eat. See below for a note about portions. Prepare a lemon and oil dressing by mixing together 1 part extra virgin olive oil and 1 part lemon juice. Cut a a piece of foil large enough for each individual piece of fish to be wrapped up in. Ensure the whole fish are completely gutted and cleaned. Brush olive oil all over each psari. 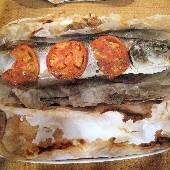 Place each fish in the middle of each piece of foil. Season the psari with salt and pepper inside and out. Spoon some of the olive oil and lemon juice dressing over the top of the fish. Place a couple of the lemon slices on the top of each one. Fold the foil up over the food and join at the top. Crimp or fold over where the foil joins, so it doesn’t come open. Place the foil packages on a greased baking tray in a pre heated oven 180 / 355 F / gas 4 for about 30 minutes. 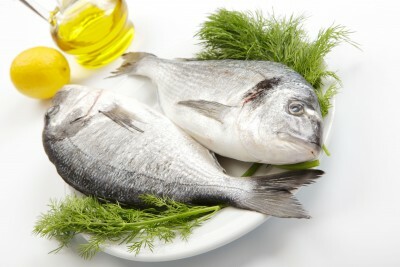 Serve, with the latholemono – lemon and oil dressing on the side to drizzle over the fish as per taste, or just lemon wedges. Serve with baked potatoes or chips and salad, for a quick easy meal. Serve with baked vegetables for a healthy meal that would suit any diet or health conscious menu plan. Easy fish recipes is ideal for mid week meals when you’re short of time but still concerned about serving fresh, healthy meals. Note About Portions – buy 1 steak, whole fish or 1-2 fillets, depending on size per person. Depending on serves and likes, you can make up as much lemon juice and olive oil dressing as you wish, you can easily add more to it, just ensure you add both lemon juice and oil to increase the amount. Add a few drops of white wine, chopped lemon grass or any other complimentary herbs such as parsley, oregano, dill or chives to the foil packages before baking.